For twenty years, Mark Bittman’s How to Cook Everything has been the definitive guide to simple home cooking. 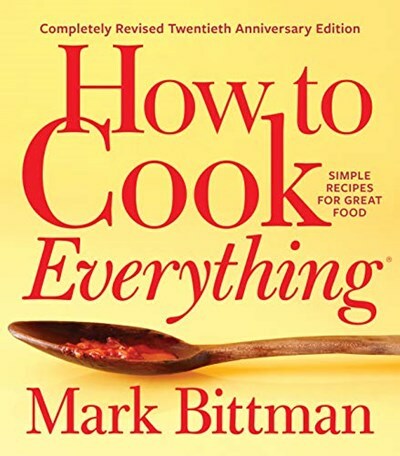 This new edition has been completely revised for today’s cooks while retaining Bittman’s trademark minimalist style—easy-to-follow recipes and variations, and tons of ideas and inspiration. Inside, you’ll find hundreds of brand new features, recipes, and variations, like Slow-Simmered Beef Chili, My New Favorite Fried Chicken, and Eggs Poached in Tomato Sauce; plus old favorites from the previous editions, in many cases reimagined with new methods or flavors. Recipes and features are designed to give you unparalleled freedom and flexibility: for example, infinitely variable basic techniques (Grilling Vegetables, Roasting Seafood); innovative uses for homemade condiments; easy-to-make one-pot pastas; and visual guides to improvising soups, stir-fries, and more. Bittman has also updated all the information on ingredients, including whole grains and produce, alternative baking staples, and sustainable seafood. And, new for this edition, recipes are showcased throughout with color photos. By increasing the focus on usability, modernizing the recipes to become new favorites, and adding gorgeous photography, Mark Bittman has updated this classic cookbook to be more indispensable than ever.